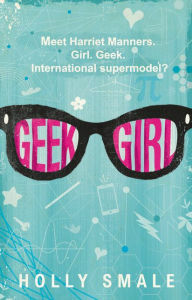 I picked up Geek Girl by Holly Smale because I was looking for something that wasn't fantasy. An awful lot of that stuff in the libraries around here in the YA department. Geek Girl was a great break from that. It's a YA book with a little romance (lot of that in the YA departments around here, too) and a real story. The real story is that the narrator, Harriet, is a very bright, achieving student, and, as the title suggests, a geek. She suffers from one of those over-the-top bullies. She also has a best friend who has always wanted to be a model. Friend gets Harriet to go with her to an event where modeling agents will be looking for talent and...guess who gets spotted! Harriet accepts this situation in the hope that it will change her life. What makes this book so good is that it is funny. Not funny in the I'm-trying-to-be-funny-and-failing sense or in that this-is-supposed-to-be-funny-so-laugh way you sometimes see in books. The humor is organic to the story and the character and works. Harriet seems to follow along in the tradition of Adrian Mole and Georgia Nicholson. She doesn't tell her story in the form of a diary, as those characters do, though she does use lists. But the family and friends around her and how she responds to them made me think of a smarter, deeper, and more realistic Georgia. And I read this just before Louise Rennison's death, so I didn't have her on my mind. Adrian is already deep. When I was speaking in a school last week, I used Geek Girl as an example to support my points about writing what you know (author Holly Smale was a model for two years as a teenager) and the function of friends in fiction (Harriet's friend gets the plot going).